Steve's pedigree was established during the infancy of his education and has continued throughout the duration of his legal career – take pride in what you do, be passionate about what you do and get it done . . . always. Steve seeks to attain his clients' goals and make their causes his own. He perpetually strives to accomplish this goal by exhibiting an intense, strong and demanding work ethic as well as initiative, and thinking outside the box. His credo Pride, Passion and Perfection, is the credo for the firm. Steve has practiced law for more than forty (40) years, during which time his experience has included representing both publicly held and closely held entities as outside general counsel and outside counsel, attending to their varied legal needs. 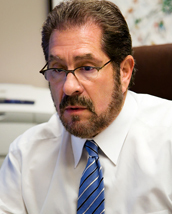 He also has developed extensive experience by representing a diverse segment of the client population, servicing their needs in connection with a myriad of corporate and commercial matters, contract matters, diverse real estate transactions, general transaction matters, employment law, matrimonial and family law matters, immigration matters, criminal law situations and extensive litigation, arbitration and mediation, both nationally and internationally. He has litigated extensively in each of the foregoing legal disciplines, as well as complex estate matters and varied numerous other contract, commercial and business law matters before federal and state courts in more than fifteen (15) states in the United States, as well as internationally, and has participated in hundreds of mediations and arbitrations while having mediated numerous other disputes. Steve began his legal career clerking to the Chief Judge of the United States Customs Court and teaching courses at the University level, at Law School, and has been a guest panelist on radio shows concerning various areas of the law including Constitutional Law. Additionally, Steve served as outside General Counsel for many years to a wide variety of publicly held and privately held entities, involving the entertainment, communications, publishing, dietary supplement, bodybuilding, advertising, various forms of distribution and commercial real estate industries. an international federation of bodybuilders as outside general counsel attending to the corporate and other legal requirements of such an organization which was international in nature. Additionally, during his 40 plus year legal career, Steve has been a member of each of the American Bar Association, and New York Bar Association, New York City Bar Association, Suffolk County Bar Association as well as a the Brooklyn Law School Alumni Association and New York University School of Law Alumni Association. Steve and has served on numerous committees for the American Bar Association and New York State Bar Association involving topics such as ethics, lawyers in transition and financial planning for lawyers. Most recently, Steve was appointed to Chair the ABA committee on Alternative Dispute Resolutions for the Solo, Small Law Firm and General Practice Division of the ABA as well as to serve on the Advisory Committee for that Division. Steve is also the Chair of the Alternate Dispute Resolution Committee for the Suffolk County Bar Association and has been appointed as Advisor to the Study Committee on the Domestic Unsworn Declarations by the American Bar Association Solo, Small Law Firm and General Practice Division of the ABA as well as by the ABA Section of Tort, Trial and Insurance Policies. In addition, Steve was elected to serve as a liaison for the entire ABA Dispute Resolution Advisory Committee. Steve also serves as a member of the ABA’s Business Advice and Financial Planning Committee and the ABS’ Business Opportunities and Commercial Law Committee. Steve has also served as the New York State representative on the Presidential Business Commission as well as the Co-Chairman on the Presidential Business Advisory Council. He is also a member of the New York City Bar Association. Steve also is very involved with the Public Advocacy Program at Touro Law School as well as with the International Justice Center for Post Graduate Development. Steve received his B.S. from Queens College of the City of New York and his J.D. from Brooklyn Law School. He also received an LL.M. degree from the New York University School of Law Graduate Law Program in Corporation Law. Steve is admitted to the Courts of the State of New York, United States Federal Courts in the Eastern and Southern Districts of the State of New York, United States Tax Court, United States Customs Court, United States Court of Appeals for the Second and Third Circuits. Steve has also been admitted pro hac vice in federal and state courts in more than fifteen (15) states in the United States and more than twenty (20) courts in the United States and has been admitted to practice on a pro hac vice basis internationally.